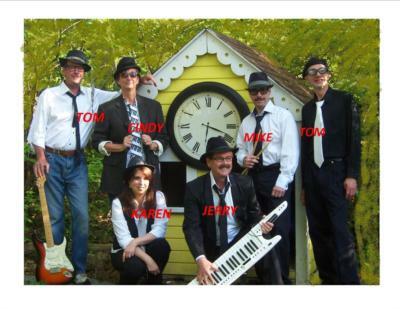 Back N' Time Band of Cincinnati is a top review 6 piece oldies band featuring music from the 60's, 70's, and 80's. Back N' Time is a perfect choice for your festival, wedding, anniversary, or oldies party when you want to add a touch of nostalgia to your event. Back N' Time provides fun and danceable music with entertainment on stage that makes the crowd know they are a part of the event. 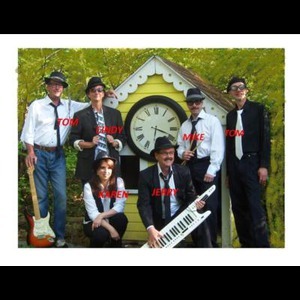 We provide a diverse mix of classic oldies to entertain groups of all ages, tailored to the crowd! Strong Vocal Harmonies - Backed by great instrumental arrangements. Versatile Sounds - Intricate mix of sounds to fit all types of musical requests - Keyboards, Guitar, Bass, Sax, Drums. Recorded music available during breaks. Our group's experience, personality and enthusiasm ensure that your event will be an overwhelming success! 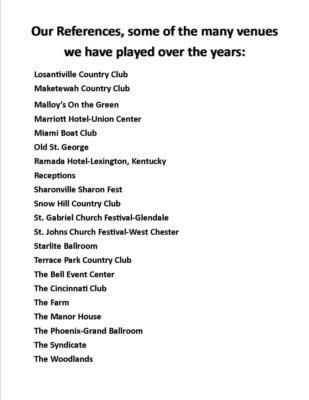 Please note Back 'n Time Band will also travel to Clifton, Terrace Park, Miamiville, Amelia, Batavia, Melbourne, Milford, Mount Saint Joseph, Camp Dennison, Silver Grove, Miamitown, Ross, Fort Thomas, Hooven, New Richmond, Dayton, Hamilton, Highland Heights, Kings Mills, Loveland, New Haven, Owensville, Shandon, Bellevue, Goshen, Newport, Newtonsville, Alexandria, Covington, Overpeck.